AFTER A SOLID BULL MARKET, A KEY CONCERN OF MANY INVESTORS IS – ARE THE MARKETS OVERVALUED? 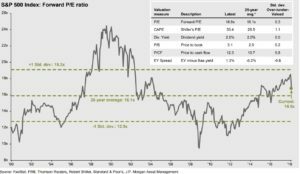 Lets look at the forward P/E ratio chart for the last 25 years. Following last few weeks of market adjustments – equities are just about average in valuations. The box, comparing other markets’ valuation measures, such real estate, bonds, etc, comes to the aid of equities – showing that equities, even higher valued than historically, are still a better long-term choice.